This paper describes a trial application of Ground Penetrating Radar (GPR) techniques to locate defects in timber girders. Keywords: Timber bridges, timber girders, Non-Destructive Testing, NDT, Ground Penetrating Radar, GPR. Within Australia a significant proportion of all road bridges are of timber construction, which are controlled by Local Government (undeclared roads) and State Government (declared roads) authorities. Of the estimated 20,000 bridges controlled by Local Government throughout Australia, over 70% are timber bridges1. On state controlled roads the proportion of timber bridges varies from state to state. Within the state of Queensland around 25% of bridges on state controlled roads are timber structures. For many years regular inspection and maintenance of these structures has been neglected due to lack of funding, the difficulty of undertaking inspection and due to a law protecting road authorities against claims due to their nonfeasance. With recent changes to the law, Australian road authorities are now required to have in place a bridge inspection and maintenance regime to protect them against negligence proceedings. The larger road authorities such as the State Governments have been progressively replacing their timber bridges with concrete structures. But many smaller organizations, such as Local Governments, cannot afford the expense of replacing a large number of these bridges and must maintain their existing stock. However with the legacy of poor inspection practices from the past, inconsistent records and the inherent difficulty of assessing timber bridges with current inspection methods, prioritisation of funds has become a major challenge for owners of these structures. One of the key challenges in maintaining these structures is in the identification of internal defects caused by fungal or termite attack. In the right environmental conditions fungal attack can result in rotting of timber elements, greatly reducing the structural capacity. 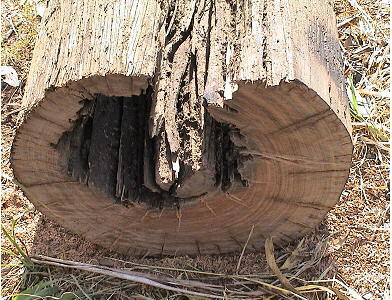 Termite attack in timber bridges usually begins after an initial fungal attack, but once established generally degrades timber much more quickly than fungi2. Eventually these deterioration mechanisms lead to a significant loss of element cross section. In girders this defect is commonly called "piping". 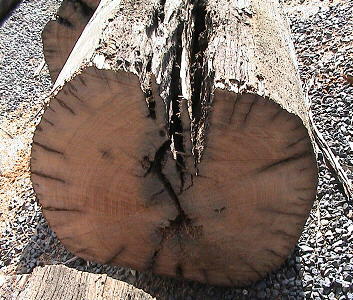 Other defect types such as splitting and cracking are also commonly found in timber elements. When looking for these types of defects, timber maintenance crews usually pay particular attention to the timber girders. This is because of their critical structural role, the difficulty of inspecting them and their significant cost to replace. The current inspection method for timber bridges is a visual inspection followed by test drilling2. However on many components, especially timber girders, large internal defects may be present, but with no outward signs of distress. In extreme cases up to 90% of the member cross-section may be consumed, leaving a hollow shell but no outward signs of any defects. As visual inspections are unreliable, test drilling locations therefore become guesswork. To improve the effectiveness of investigations, drilling is targeted in critical structural areas such as at midspan where maximum bending moment occurs, and the ends where maximum shear occurs. Particular attention is paid to the girder ends and to the outermost girders, as piping and rot are more likely to occur in these locations. However, defects of this type can occur anywhere along the length of the girder. Therefore inspectors using traditional methods can never be sure they have found all of the defects. In addition, as drilling is inherently destructive, there is a trade off between the amount of information required and the desire to minimise damage caused by the testing. While undertaking research into the investigation of concrete using GPR, the Author noted that these techniques would be well suited to inspection of timber bridges for piping and rotting defects. Ability to scan the entire girder length and obtain a 2-D radargram image of all internal defects. Ability to detect hollow defects and rot defects as well as identifying smaller defects such as cracking and internal fixtures such as bolts. Equally important is its ability to confirm that a girder is contains no significant defects, i.e. that it is sound. Ability to locate defects within the member cross section by undertaking two or more perpendicular passes. Ability to make predictions about the locations where moisture in getting in through changes to the relative permittivity of the timber. It was thought the old age and low moisture content of the timber (i.e. milled timber protected by a deck) would keep the relative permittivity of the timber low allowing good penetration of the GPR signal. In the trial the relative permittivity of timber girders ranged from around 6.4 to 7.4. Calibration of the relative permittivity can undertaken by comparing the thickness of the girder at any location to the two way travel time measured in the GPR radargram to the far side of the girder. If in doubt the location of the far side of the girder can be confirmed by undertaking a plate lift off test. A high frequency antenna was used to obtain adequate resolution within the girder. During this trial a 1.2GHz GSSI ground coupled dipole antenna was used. The GPR system used was a GSSI SIR-2000 powered in the field by a car battery. 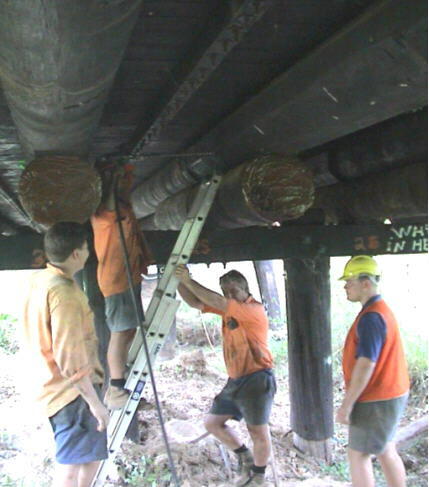 In March 2002 the Author arranged a two-part trial using three NDT techniques to locate defects in timber girders. Ground Penetrating Radar (GPR), a gamma ray transmission probe and ultrasound techniques were used in the trial. Part 1: Four girders from the recently demolished Purga Creek Bridge were transported to a depot for testing. Defect predications based on the collected data were compared to observations made after cutting up the girders. Part 2: Twenty girders in the existing four-span Redbank Creek Bridge were tested and defect predictions were made. Predictions were assessed by comparison to the results of a targeted drilling investigation. The trial was deliberately undertaken in two parts. The purpose of Part 1 was to test the ability of the NDT methods to accurately locate and characterise internal defects. 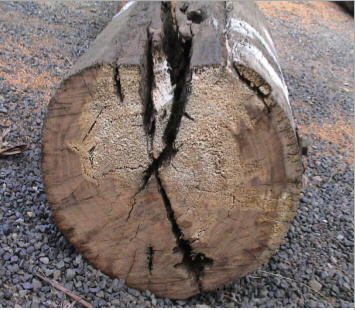 The purpose of Part 2 was to test the practicality of these techniques in the field on a real structure and to compare with the current method of evaluating the size and type of internal defects. Of the techniques trialled GPR was found to be the most practical to use in the field and produced the most reliable results. The results of the GPR trial are discussed in further detail below. There were a number of limitations with the other NDT techniques trialled. Further discussion of these other techniques is beyond the scope of this paper. Four girders from Purga Creek Bridge were salvaged during bridge demolition and were transported to a depot for testing. Prior to testing the four girders had defective ends cut off. The ends were then covered and they were placed with their spiking faces down. This was to ensure that internal defects were not visible during testing. Survey runs consisted of sliding the antenna along the length of the girder while entering half metre markers in the data - see Figure 1. Each survey run was completed in around a minute with around 30 seconds to set up for the next run. The output was displayed in real time on the SIR2000 monitor. Larger features could be identified straight away, however the average screen quality and colour palette used made site interpretation of subtle features difficult. Passes were undertaken on each girder in "2 o'clock" and "10 o'clock" orientations. These orientations were chosen as they would avoid bolts on an insitu girder. Runs were first undertaken in 8-bit format and later repeated using 16-bit format data. These results were very similar indicating a high level of repeatability. The location of internal features was predicted based on the post-processed GPR data. Post processing of the data, in particular background removal, made a significant improvement to the data quality. Defect predictions were validated by cutting up the girders with a chainsaw at one-metre intervals and comparing the predictions with defects that were found. Where the GPR data indicated features lay between the metre marks additional cuts were made to follow the defects. Overall there was an excellent correlation between the location and size of defects predicted and those found after dissecting the girders. A variety of defect types were detected including piping, cracking and rot. 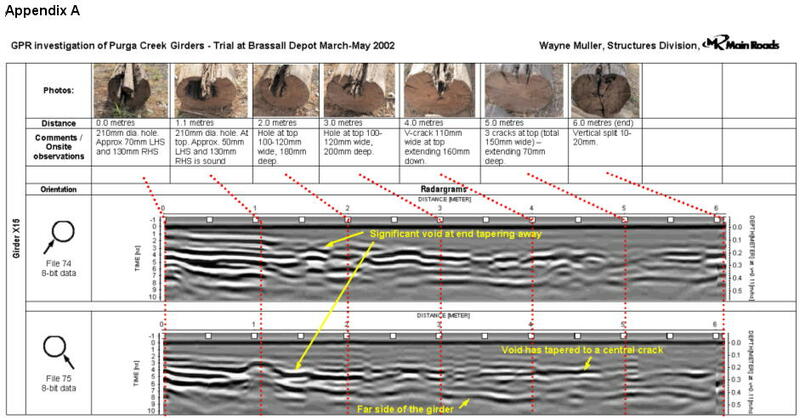 Some of the internal defects located by the GPR investigation are shown in Figure 2. An example of the processed GPR data, defect predictions and corresponding photographs for one of the girders is shown in Appendix A. The same GPR system used for the Purga Creek investigation was used for the Redbank Creek investigation. To reach the girders the GPR antenna was mounted on a fibreglass pole - see Figure 3. Again the antenna was slid along the girder length and markers were entered at metre intervals. On the inner girders two antenna passes were made, one vertical the other horizontal. On the outer girders, where there are horizontal and vertical bolts, only one survey run was undertaken between the rows of bolts. 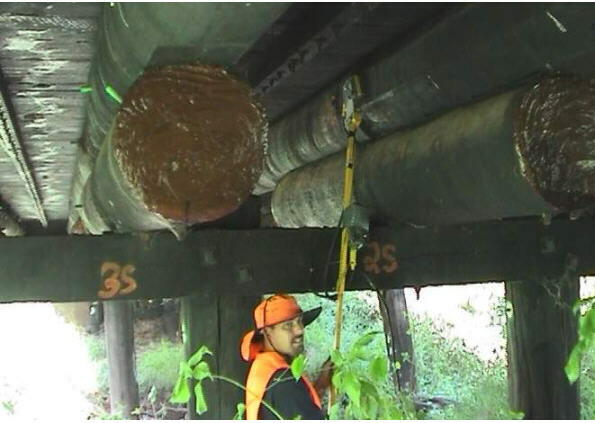 The drilling investigation was undertaken by a Main Roads specialist timber bridge crew - see Figure 4. Drilling locations were chosen onsite based on the GPR output to confirm a range of predicted features and also to confirm sound sections. At each location the defect prediction was read aloud by the Author prior to drilling. There was an excellent correlation between the GPR predictions and the drilling survey findings. Every location where a major feature was predicted one was found, and every location predicted to be sound was confirmed by the drilling. The majority of smaller defects predicted by the GPR were also found by drilling. In total 35 drill holes were undertaken. Based on the GPR data it was possible to correctly locate the position of voids and rot. The size of these defects ranged from 50mm to 350mm in size, as confirmed by the drilling. The relative size of defects predicted also correlated well with the GPR predictions. From the vertical and horizontal GPR runs the position of defects could also be located within the girder cross section. For example, in a 425mm diameter girder, if a medium size defect was noted after 200mm of sound timber in a vertical scan then the defect is at the top of the cross section (i.e. near the deck). Predictions of defect shape and orientation were confirmed by vertical and horizontal drilling. 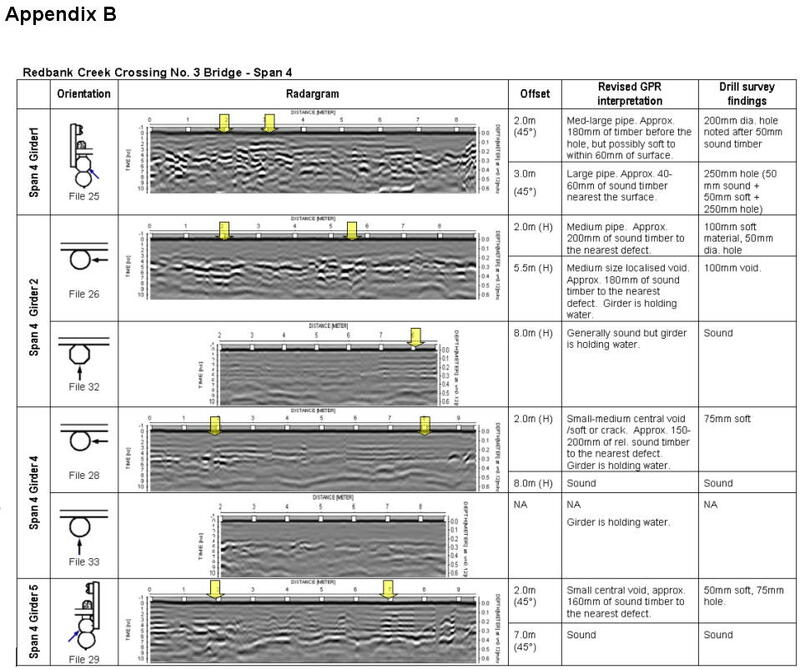 Appendix B shows a summary of GPR output, GPR predictions and drilling survey findings for Span 4 of the Redbank Creek bridge. The yellow arrows indicate the locations of drill holes. Overall the trial GPR investigation was very successful, achieving a good correlation between defect predictions and the defects found from destructive testing. The GPR equipment used onsite was portable, lightweight and fairly forgiving in its use. The antenna could be bumped, twisted or removed slightly from the girder with few detrimental effects to the data (after corrections from post processing). Entering metre or half metre markers in the data was useful in correcting for chainage, as it is often difficult to keep the antenna moving consistently while walking over rough ground. On the Redbank Creek bridge it was necessary to use a fibreglass pole to reach the girders. In taller bridges this might not be possible. However one solution may be to scan the girders from on top of the deck straight through the timber deck planks. A slightly lower frequency antenna may be required to gain additional penetration depth for this application. It was very important to post process the data to clean it up and remove spurious effects. The data was more easily viewed on a computer screen than on the field unit, which was difficult to interpret. One of the most important advantages of this method is its ability, not only to locate defects but also, to confirm that there are no defects present. This is a significant advantage over existing methods, as a large number of test holes would be required to achieve the same outcome. This ability may make GPR a useful tool in assessing the condition of timber salvaged from one bridge and being used in another. As with all NDT techniques GPR still requires some physical measurements to ensure the predictions made are correct. Initially it is envisaged that these techniques could be used to enhance and target traditional drilling investigations. Of course these techniques can also be applied to components such as exposed piles and headstocks as well as timber girders. Once the use of these techniques is established it may be possible to significantly reduce the amount of drilling necessary. The high repeatability of results as demonstrated in Part 1 of this trial indicates that it may be possible to use these techniques over longer periods to monitor rates of deterioration. 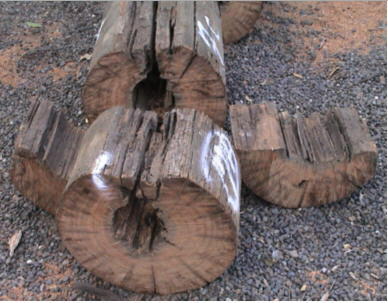 A trial was undertaken using various non-destructive techniques to locate internal defects in timber girders. Of the techniques trialled, Ground Penetrating Radar (GPR) was found to be the most reliable method of locating internal defects such as piping and rot. Overall there was an excellent correlation between the GPR defect predictions, test drilling and inspection after cutting up of girders. In use the system was quick, lightweight, mobile, safe for personnel and well suited to field conditions. Interpretation and post-processing of the GPR data was sometimes complicated and required experienced personnel. The results of this trial on timber girders have been promising, and have demonstrated that GPR has a number of significant advantages over existing timber girder inspection methods. Champion C, et. 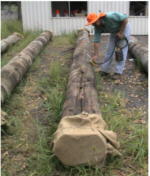 al (2002) - 'Assessing the load carrying capacity of timber using dynamic methods'; IPWEAQ 2002 State Conference, Noosa Lakes, Australia. Queensland Department of Main Roads (2000) - 'Bridge Inspection Manual'; Version 1, Brisbane, pp. 1.8; 2.14-2.15; 2.30. Wayne Muller is a Civil Engineer who works for the Queensland Department of Main Roads. Wayne has been with Main Roads (MR) for 7 years and has worked in a number of roles including District work, onsite bridge and road construction and most recently working in MR's Structures Division. For the last 31/2 years he has worked in the Concrete Technology section of Structures Division, providing advice to Districts on the construction and maintenance of concrete bridges. During this time he has developed a particular interest in the use of non-destructive investigation techniques.